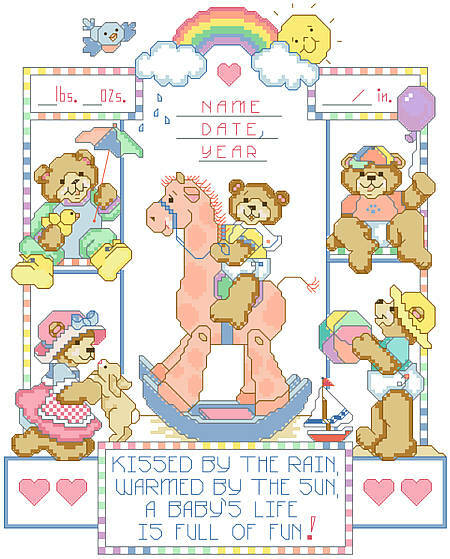 This sweet family of bears birth record will melt the hearts of the new parents who are welcoming an adorable baby into their lives. The record's little teddy bears are almost as cute as new baby. 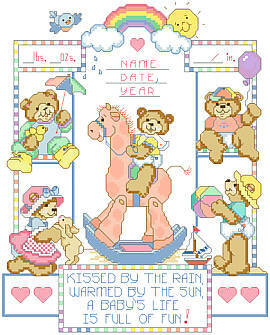 Stitch this piece for the mother-to-be on her baby shower and she will cherish it for years to come! Contents: Stitch count 118w X 147h, Finished size on 14 count 8-3/8" X 10-1/2"